Sportlaan 1154 Price asked € 298.000 k.k. Beautiful and well maintained, cozy 4-room apartment with beautiful room-ensuite, 2 bedrooms and balcony with fantastic views over the green and water of the Segbroekplantsoen. Entrance apartment, hall, cloakroom, meter cupboard. Lovely and bright room-ensuite approx. 4.83 x 4.11 and approx. 4.83 x 3.12 with sliding doors, 3 built-in cupboards and double doors to sunny balcony approx. 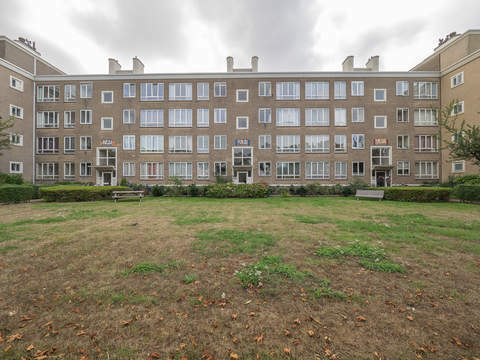 3.45 x 1.40 facing southwest with beautiful views over the green of the Segbroekplantsoen. Spacious front bedroom approx. 5.00 x 3.00 with built-in cupboard and access to modern bathroom approx. 1.77 x 1.83 with bath, washbasin, design radiator and mechanical ventilation. Second front bedroom approx. 3.91 x 1.77 with built-in cupboard. Modern toilet with hand basin. Luxury kitchen approx. 3.91 x 1.96 with many cupboards and various equipment such as 4-burner stove, oven, dishwasher, hood, 1.5 sink, fridge / freezer with 3 drawers and washing machine connection. Private storage approx. 3.09 x 1.63 in substructure. Situated on lease-hold land, ending at 31 December 2027. The rent charge is € 1.13 per year. Central heating system, brand Intergas, built in 2011. The volume of the apartment approx. 281 m³.